Over the years, the emphasis on training within the construction industry has increased ten-fold as every aspect of the building trade is covered. There are companies that specialise in this training and for this month’s edition of Irish Trucker, we profile one such firm. Safety First Consultancy Ltd offers a comprehensive range of services and their expertise has helped thousands of clients since its inception in 2001. Managing Director Fergal McKevitt outlined the services provided by the company who also sell a range of safety equipment. Headquartered in Dundalk, Co Louth, the business has grown considerably over the years as Fergal revealed. “We started out on a small scale, but we now provide a full range of services and every aspect of the building trade is included in that,”said Fergal. As one of Ireland’s leading providers in First Aid and Health & Safety training, this nationwide training centre offers courses to suit the client’s needs, whether it be flexibility, tailoring or programmed training. There are numerous companies that specialise in this area but Fergal feels that they have put a package in place that caters for all. “We use fully qualified and experienced trainers and have accredited training course development procedures. We are also approved by all relevant organisations, while you can choose from a range of scheduled courses or let us come to you. “All the materials we use are of top quality and the inclusive fees cover the cost of workbooks, examination and certificates. Finally, the client will have the assurance of using a reputable training consultancy. Regulations are always being updated in the construction industry and only recently, new regulations have been brought in for working at heights and at Safety First Consultancy Ltd, they are now accredited to do this training as part of their long list of services. As stated, this family run business also supply a wide range of safety products including First Aid Equipment, Breathing Apparatus, Fall Arrest Equipment, Helmets, Ear Muffs, Ear Plugs, Boiler Suits, Shop Coats, Safety Boots & Shoes, Safety Glasses & Goggles, Fire Blankets & Extinguishers. The team at Safety First Consultancy Ltd have years of experience behind them and this is why so many clients turn to them for advice. Since many companies do not employ their own Safety Specialist, they fail to comply with health and safety legislation, leading to increased accidents and insurance costs. To enable you to meet the standards required by law. Air Monitoring, Soil Sampling, Risk Assessment, Visual Display Screen Assessment, Development of a Safety Statement and Development of Safety & Health Plan (Design & Construction Stage). “Our work is very varied. 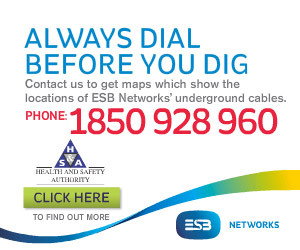 We would do a lot of investigative work as well, while I am also involved with the National Irish Safety Organisation (NISO). 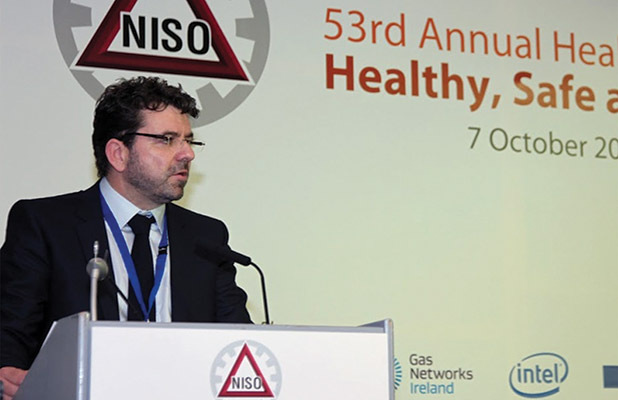 “The aim of NISO is to help organisations reduce the number of fatalities and injuries that happen in Irish workplaces each year. Fergal and his staff of six employees that includes his wife Anne who looks after the administration side of the business, are continuously working hard to ensure that the cover all services within in the industry.